The MUIC Social Science program has helped me to develop my cognitive skills through student-centered learning engagement and research-based learning experience. Being pilot is a job that requires task management skills (often refers to risk management), and multitasking under tremendous pressure. To become a pilot, an individual must pass several tests including an aptitude test. I believe that my learning experience as a student at MUIC’s Social Science program has prompted me to successfully go through the three main domains of learning, which are, cognitive (thinking), affective (emotion/feeling), and psychomotor (physical/kinesthetic). Because of these three respective domains, I did not have much difficulty in going through the aptitude test. English is also another significant skill that a pilot must possess, and the Social Science program requires full usage of English, starting from speaking in class discussions, reading numerous English texts and articles, and writing essays. In 2012, I went on to pursue a Master’s degree through an online learning program at Walden University (USA) and graduated in 2013. After graduating from MUIC, I was a full-time kindergarten to high school teacher at KPIS (Keerapat International School). I then decided to change my career path to aviation and my current job is captain of an Airbus A320 passenger plane at Bangkok Airways. No matter what your status, you’ll always have to face challenges in life. To get by and become successful means that one must demonstrate the ability to deal with and handle problems effectively. A basic tip that I would like to share will be, rationalize the course and effect of the problem, then prioritize the urgency of each problem, and determine proper action that gives the highest probability of preferred outcome. Embrace life challenges since you can only grow by overcoming them. My name is Pichamon Anekvorakul (Sungsung). I graduated with a B.A. degree in Social Science. I am currently working as an Online Marketing Consultant. After graduation, I joined MTV EXIT foundation as a Social Media intern, then started my first career in business consulting firm. I had also been doing a few part-time jobs, including interpreter, master of ceremony, DJ, and event organizer. At that time, I had to go on several business trips abroad, and my strong background in social science helped me to overcome cultural barriers when communicating with people from different nationalities and professions. Understanding that there are other ways of thinking and interpreting things allowed me to become more open-minded, and be able to gain much knowledge in various fields and ear experience from my work life. I have recently made a career shift by working in a digital agency because I believe I can gain another set of knowledge that is essential to the modern world. Although I did not have any digital related background, studying social science has helped me acquire the ability to think critically, as well as to combine analytical and creative skills to generate the best outcomes for any tasks. I am so grateful to be a part of the Social Science Division, as it is a passport to my success today. 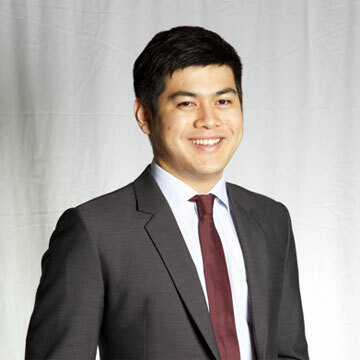 Mr. Karin Kunjara Na Ayudhya (Plai) is a rising diplomat at the Ministry of Foreign Affairs of Thailand. 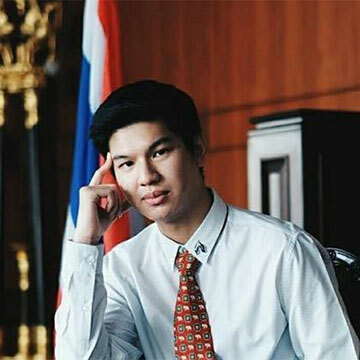 He currently holds the position of Second Secretary at the Department of International Organizations and is responsible for facilitating Thailand’s obligations in disarmament of conventional weapons. During his two years at the Foreign Ministry, Karin has also covered counter-terrorism and sanctions within the United Nations Framework. 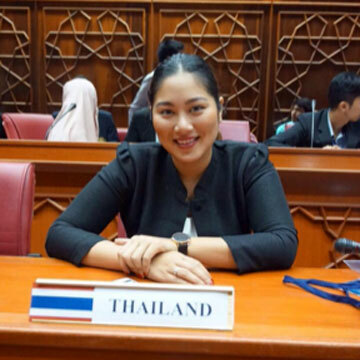 Most recently, he was the delegate of Thailand to the First Committee of the 72nd Session of the United Nations General Assembly in New York. During his two months in the Big Apple, he worked on taking forward various disarmament issues, ranging from nuclear weapons to killer robots. 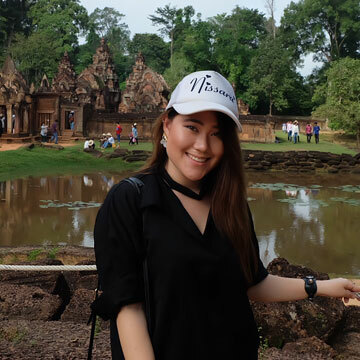 Prior to joining the Foreign Service, Karin was Project Coordinator at Right To Play Thailand Foundation, a Canada-based NGO that utilizes sports and play to educate and empower youth in disenfranchised communities throughout Thailand. He graduated with a Bachelor of Arts in Social Science (First Class Honors) from MUIC and a Master of Science in Political Sociology from the LSE, UK. In his free time, Karin is an avid travel photographer. The degree introduced me to diverse aspects of contemporary world affairs. I took a range of courses spanning from international relations, world history, sociology and anthropology, and selected area studies such as Southeast Asian Studies. Bit by bit, the study helped satisfy my curiosity by giving insight into a captivating world, vast and vibrant, filled with various peoples with distinct languages, beliefs, traditions, and cultures. Social Science helped me engage in global discourse and cultural awareness, and boosted both my self-esteem and critical thinking capabilities. Social Science opened me up to the world, taught me to be more deliberate, and most importantly, to treat others with respect. After I graduated from MUIC, I went to the UK to pursue a master’s degree in Human Resource Management and Employment Relations at Queen Mary, University of London. Later, I did my internship at MCOT, but found out I didn’t like HR. I got a job at Central Department Store as a Social Media Coordinator. One year later, I joined a small French digital marketing agency called Garcon Consulting as a Social Media Account Director, handling over 10 accounts (including Centara, Jaspal, El Gaucho, etc) with 7 people in my team. I think graduating with a degree in Social Science is one of the turning points in my life because it has taught me to question everything, including authority. So I find myself barely blinded by social conditions and so on. It has also helped me develop critical thinking and writing skills. They are one of the most crucial skills when it comes to work and academic life. I would also like to offer some suggestions for the later generations of Social Science students, based on my own experience. It would be helpful to have a mentor who can guide them through their career path, job applications, internship offers (in more variety), and graduate degrees scholarship /opportunities. I would like to have a stronger Social Science alumni network so that the students can have closer contact with their more experienced seniors to guide them. This is an opportunity I was not able to get. It would also be great to let the students handle special Social Science projects together; not only is it good to the university and faculty, it will also be a part of their resume. On a personal level, the Social Science Program gave me the tools to appreciate the diversity of ideas, re-examine my own beliefs, and approach new issues with an open, critical mind. This mindset proved important since it allowed me to continue to learn, develop new skills, and work collaboratively with others to overcome different challenges on issues that we are passionate about. My first full-time work out of college was with a women’s leadership development organization, whose mission was to unlock women’s potential through innovative financing solutions for university education and lifelong mentoring. The knowledge I gained through the Social Science Program, particularly on Research Methodologies, helped me manage a research initiative on the financial returns on investment in education in Cambodia, which paved the way for the first ever equity-like investment fund into women’s education in Asia, making university education more affordable for many young women in Asia. My degree in Social Science majoring in International Studies taught me how to view society through different sociological theoretical approaches. Each perspective provided a critical understanding of social and institutional structures and a deeper appreciation for cultural differences. The degree taught me to think systematically and creatively about a situation beyond its surface value while allowing me to form logical observations and arguments based on facts and data that are applicable beyond the field of social sciences. I also learned about resolving disputes in a negotiation course, interstate relations in an international relations course and the development of South Asia in a contemporary context. I found a common theme through all the courses; which was economics was the basis of the problems discussed in class. This is what led me to continue my studies in a Master’s of International Political Economy in the UK. Nena obtained her Master’s degree in International Relations (with Merit) at the University of Bristol in 2015. 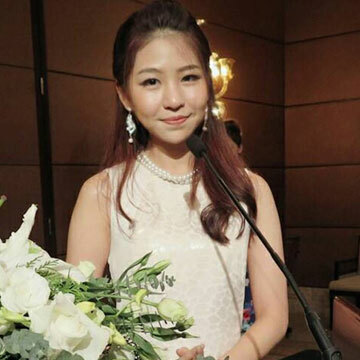 During her time at MUIC, she was part of the Student Committee for 4 years, a committee member of Enactus Club (SIFE) and a member of several charity projects. 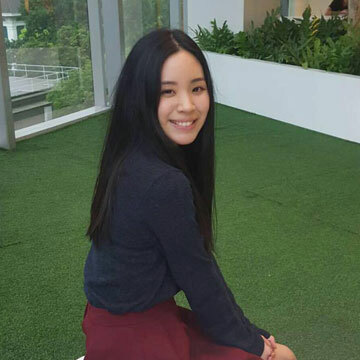 She joined the IOM Regional Office for Asia and the Pacific based in Bangkok as an intern for 6 months with the Labour Migration and Human Development (LHD) Unit, and got an offer for a position of Regional Research Assistant. She also plays a role in stakeholder engagement including participating and representing IOM Regional Office in several events and dialogues; providing inputs and advice to key partners including UNESCAP, UN Women and ILO; a member of the Project Advisory Team for the UN Women Standard Terms of Employment Regional Project, and the Colombo Process; and acted as the focal point for the ASEAN Forum on Migrant Labour. The Social Sciences program offered at MUIC has prepared me extensively for the life choices I made after completing my studies. The enriching and challenging programs offered demanded critical thinking and analytical skills which prepared me for the Master’s of Philosophy (MPhil) in Development Studies at the University of Cambridge and later onto my research as a PhD candidate in the same program. I was introduced to a range of significant researches on Thai studies that enabled me to further delve into my interests in a critical approach of studying Thai state formation and minority relations. To this day, I still believe that the class size provided in the Social Sciences courses were extremely beneficial in allowing us to have critical discussions between students and the lecturer which are akin to ‘supervisions’ provided in universities abroad. Such scholarly debates allow us to further develop our critical thinking skills, and promotes a dynamic educational interactive experience between students to students, and lecturer to students that extends beyond the conventional educational setup. Currently, I am a PhD candidate researching on the impacts of self-perceived collective victimhood and the politics of belonging amongst Patani Melayu youths in the conflict-ridden region of Patani / Deep South . As well as conducting my PhD research, with over 3500 youths in the region, I have been working closely with the civil society groups in the Patani region as well, which focuses on programs enhancing local capacity for socioeconomic research, and grassroots initiatives aimed at building local leadership and guided work on community-based reconciliation within the village levels throughout Pattani, Yala and Narathiwat provinces. The Social Sciences program offered in MUIC is like a key to many different doors of opportunities. The courses provided not only gives us time to think about what field we would be interested to further study in, but also prepares us for our ventures in attaining higher studies abroad. I would recommend prospective students to take the time and enjoy the studies provided by an extensive range of high quality lecturers, to utilize all the resources provided by the University as much as possible in order to not gain just a paper degree, but to graduate as an enriched and open-minded human being ready to contribute to others. It took me five years to complete my honor degree in Social Science and minor in Psychology in 2015. 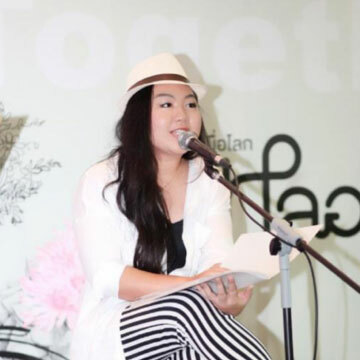 Currently, I’m a secretary, speaker coordinator and translator in one of the top training companies in Thailand. I take care of sponsorship for TEDxBangkok. I’m also a team writer at Positive Psychology Program and was invited to speak and write about relevant topics of positive psychology internationally. Also, I used to be a conference secretariat in AMCDRR held by the Royal Thai Government. Occasionally, I’m on and off being a note taker and a transcriber for the academic department at Thai PBS. Apart from that, I was a production assistant in making a short film competition organized by Tourism Authority of Thailand. My freelance job would be a singer at the House and Garden Fair every year and a part-time English tutor just like a normal student and volunteered to teach in some campaign like Saturday School projects. How Social Science helped you in your career? What I got from Social Science is not a straightforward output just like a stereotype that university is the factory of employees. In fact, it was the pattern of analytical thinking to challenge, doubt, formulate, and create a new approach and implementation. I usually combine different things together. I can discuss anthropology with a firm, using history in political aspects, understanding marketing by using social theory or even sounds smarter by giving a quote of some famous theorist while doing a presentation. Lots of reading? Yes. But believe me, knowledge will make you stand out in a crowd. Social Science helped me understand world issues from a broad spectrum. It helped me understand how individuals and society interact within systems, institutions and organizations. Studying Social Science helps you to question EVERYTHING and understand more. This faculty has given me a great foundation of how the world works from the past to present and helped prepare me for the future. It was also a place where I’ve met and shared ideas/values with people who care about the world around them and want to make a difference. I remembered learning so much from my professors and classmates and always having constructive debates and discussion on countless issues. I owe my entire career to MUIC Social Science, without it I wouldn’t be where I am now. After graduating from MUIC, I had a number of jobs in communications and management positions with the International Committee of the Red Cross, Save the Children, UNHCR and International Organization for Migration. I then pursued a Master’s Degree in Peace Studies at International Christian University in Tokyo under a fully-funded scholarship by Rotary International where I was awarded as a Rotary Peace Fellow (2012-1014). 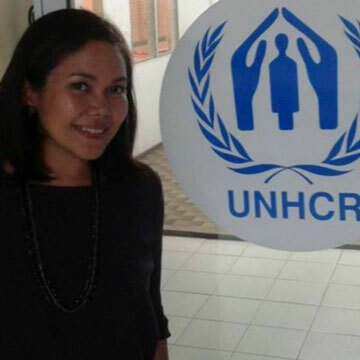 Currently I am working as Assistant Repatriation Officer for the United Nations High Commissioner for Refugees (UNHCR) under the UNHCR Thailand-border operation. My role is a border-wide focal point on any issues related to repatriation of refugees from Myanmar residing in nine temporary shelters along the Thailand-Myanmar border. If you are thinking about joining MUIC Social Science, well, stop thinking and just do it! Ask yourself the following questions: Do I care about the world? Am I interested in international affairs/news, world politics, conflicts, disasters, international organizations, history, world thinkers etc? Do I enjoy learning about changes in the world? Would I one day like to work for international organizations/non-profits organization/ or work outside of Thailand? If you answered yes to any or all of these, then you will enjoy studying Social Science at MUIC. On the whole, the MUIC Social Science program allowed me to understand and appreciate more our place as human beings from the past to present. It also made me aware of international society as well as global issues that are affecting countries around the world. I gained knowledge of such things as human rights, international law and humanitarian crisis. Apart from the knowledge and experience gained, the program also taught me plenty of invaluable practical life skills which I still use up until today, such as time management, analytical thinking and critical thinking. I am a consul at the Royal Thai Consulate-General, Ministry of Foreign Affairs in the Kingdom of Saudi Arabia. My main responsibility is to represent Thailand and Thai people in the western region of Saudi Arabia in various aspects. 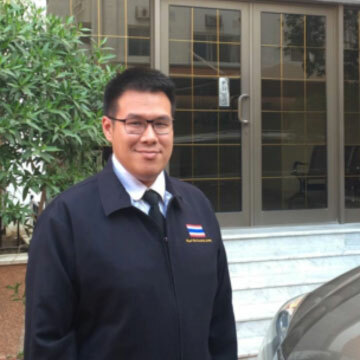 My job involves protecting the national interests of Thailand, safeguarding Thai nationals who may be in distress or in need of state services such as birth and death registration, visas, Thais facing violence among many other tasks and assisting Thai pilgrims who come for the annual Hajj pilgrimage in the city of Mecca. In addition, as Thailand is an observer state in Organization of Islamic Cooperation, I have to liaison between the OIC headquarter in Jeddah and the Thai Ministry of Foreign Affairs. Choosing the career path you want to pursue and the course you want to take in your university years are perhaps two of the most important decisions that you will ever make in your life journey. It is therefore imperative that you choose the path towards your success carefully. Likewise, working towards your ultimate goal is never an easy task; you will inevitably be faced with many setbacks, obstacles and challenges along the way. The most crucial things are for you to study diligently with enthusiasm and to never give up on your dream.